The hummingbird is a singular natural spectacle -- a true rara avis -- an insistent life force, fed on sweetness, and seemingly tireless. It is the quintessence of chi. No wonder a hummingbird is a feng shui symbol to attract beneficial chi to your environment. Hummingbirds are native to the Americas, from Alaska to Chile. Any Chinese or Asian mythology concerning the hummingbird is borrowed and relatively modern as the birds are not indigenous to that world. But Native American mythology concerning the hummingbird is rich and varied. The tiny, whirring birds are so jewel-like and so phenomenal in their feats that they are the stuff of fairytales or legends. Hummingbirds, according to Cornell University, beat their wings at up to 75 times per second. They travel up to 500 miles, nonstop, in less than a day over the Gulf of Mexico during their annual migration. The minute birds, who only weigh about as much as a single penny, are infinitesimal and awesome. The birds' symbolic qualities match their biological feats. The Aztec god of war, Huitzilopochtli, is a hybrid of hummingbird and warrior -- Aztecs believed their dead soldiers were reincarnated as hummingbirds, tireless and enduring. The exquisite sheen of the hummingbird reflects the light of the sun in glorious, iridescent colors -- more evidence that the tiny totems were heaven-sent and uniquely blessed. Hummingbirds were messengers between worlds, capable of showing mere mortals the way to salvation, victory in battle, and good fortune. The Taino people of the Caribbean believed that hummingbirds were bits of the sun, symbols of rebirth, bringers of luck. Native American legends give hummingbirds credit for interceding with the gods, bringing rain to drought, purifying the earth and embodying perfect life force and beauty. How do you capture the fleeting life force of the hummingbird in your energetic environment? 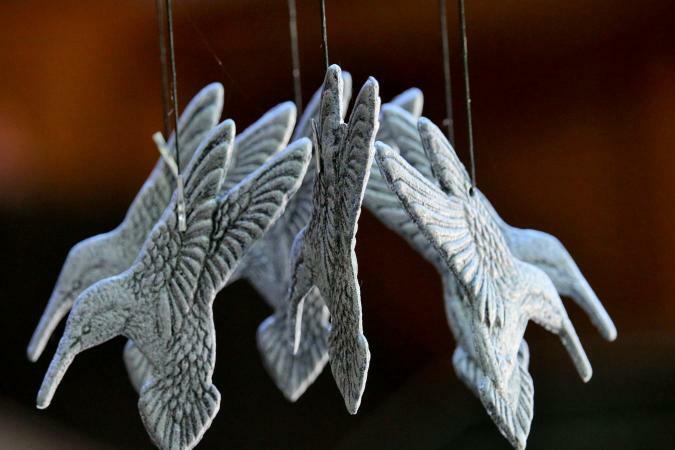 There are two main ways: add art work -- figurines or paintings -- in the form of the hummingbird; or add real hummingbirds by attracting the migrating birds to your yard or garden. Feng shui relies on placement for enhancement of energy flow. 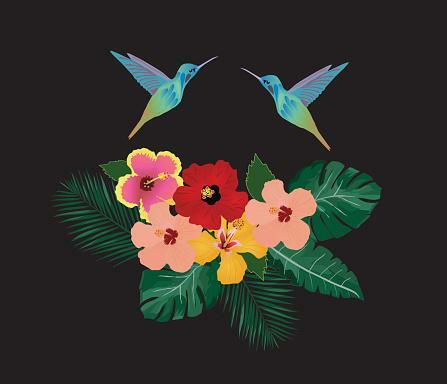 A representation of a hummingbird in the wealth, fame/reputation or travel/helpful people area of your home, according to the bagua, will promote positive chi and increase opportunities. If you are looking for romance or a partner, always display two hummingbirds to encourage relationship, not solitude. Hang a picture of one or more hummingbirds in a nursery to magnify the pure energy of small, potent beings. Paper the upper wall of a dining room or breakfast nook, above a chair rail, with good quality painted hummingbird wallpaper to evoke the flitting, humming, tenacious and adventurous spirit of the birds. The energy will enliven conversations and appetites and, in a breakfast nook, kickstart your day. Add a hummingbird feeder to your entry -- near a front door or often-used back door -- or yard. Keep the feeder scrupulously clean and filled with sugar-water nectar to attract the birds and their high energy to your environment. Plant vines and flowering shrubs with bright colored blooms -- red is best -- to encourage hummingbirds, bees and butterflies to feed, flutter and stir up positive chi at your front door or in your garden, ideally in a location that is visible from a window or sidelight. Bee balm, impatiens, hollyhocks, morning glory, scarlet runner bean, yucca, and butterfly bush all supply the nectar that the birds and their fragile insect counterparts need to survive. Hummingbirds are delightful and, if you succeed in luring them to your yard, they will charm you. Go ahead and be charmed. But, whether your tiny whirring jewels are made of porcelain, wind chimes, or real, fluttering fluff and feathers, let them remind you of the boundless energy and perseverance contained in a very small package, imparting good energy to your surroundings and to your life.